In the press release the OFT said: “We urge all Trusts to take steps to ensure they are compliant with competition law when engaging in commercial activity.” This of course begs a question: when are NHS bodies engaged in commercial activity? This question becomes more pressing from April 2013, when Monitor, at present the independent regulator for NHS foundation trusts, gains power under sections 72 and 73 of the Health and Social Care Act 2012 to apply competition law in the health sector. The question of the application of competition law to NHS providers has been running since April 2002. The Director General of Fair Trading had concluded that competition law was not applicable to an NHS body in relation to activities funded from general taxation. The decision was overturned by the Competition Appeal Tribunal. However, the OFT took a subsequent decision of the Court of Justice to support its original position. Then, in July 2010, the Department of Health proposed that competition law be applied “to both publicly and privately funded healthcare.” This reignited an intense debate over the circumstances, if any, under which those providing publicly-funded health services are required, or may be required, to comply with Articles 101 and 102 TFEU or the Chapter I and II prohibitions contained in the Competition Act 1998. 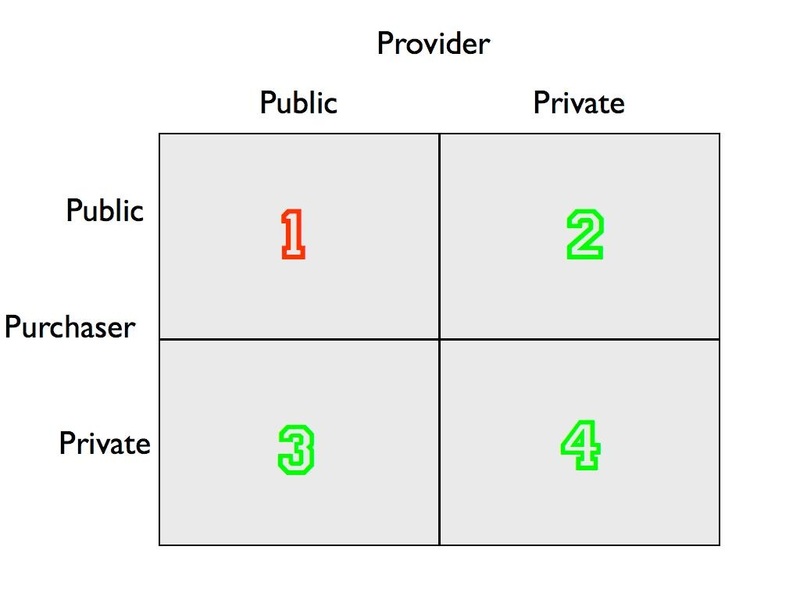 It helps to set out four types of relationship that arise when thinking about the provision of health services. I will take these relationships in reverse order. Relationships of type 4 are those to which competition law commonly applies – private providers satisfying the needs of patients using their own resources. Competition law also clearly applies to type 3 relationships – publicly-owned providers satisfying the needs of patients using their own resources. In England public providers take the form of either NHS trusts or NHS foundation trusts. Most hospitals run by an NHS trust or an NHS foundation trust have some type 3 activity. This may include such things as operating retail outlets, selling advertising space, leasing buildings or land, through to treating privately funded patients. The August 2012 OFT warning relates to a type 3 relationship. Type 2 relationships are more complex. A type 2 relationship exists, for example, with Independent Sector Treatment Centres. These are privately-owned, but are contracted to provide services to NHS patients free of charge. They were introduced in England in 2003, primarily to help the NHS reduce waiting times for planned operations and diagnostic tests. It is clear that the provider in such a relationship is subject to competition law. It has been the position of the purchaser (i.e. the NHS body) in this relationship that has caused controversy. In BetterCare the Competition Appeal Tribunal held that the purchaser was an undertaking, and so subject to competition law. However, in the later case of FENIN the Court of Justice held that the activity of purchasing did not make an entity an undertaking, so competition law did not apply. The Court of Justice in FENIN is also clear that if the purchaser does not go on to resell the subject matter of the transaction, then it does not act as an undertaking. The logic is that, instead of competition law, the purchaser is subject to procurement rules. In relation to a particular transaction an entity is either an undertaking subject to competition law, or a contracting authority subject to procurement law, but never both (compare Case C-264/01 AOK Bundesverband with Case C-300/07 Hans & Christophorus Oymanns GbR v AOK Rheinland/Hamburg). This would make sense if procurement law can be said to address all the risks associated with monopsony power. This then leaves the type 1 relationship. Is competition law applicable to publicly-owned healthcare providers in transactions involving the provision of a service to a public purchaser? The question has yet to be directly addressed by either the Court of Justice or the English courts. In the NHS context the public purchaser is free to obtain health services from “any person or body” (NHS Act 2006 s.12(1)). This enables private providers to compete with NHS trusts and NHS foundation trusts to provide services demanded by a public purchaser. Principles of competitive neutrality would suggest that competition law applies. (There used to be a ‘preferred provider’ policy whereby only public providers could supply public purchasers, but the policy was halted before its legality could be tested.) Of course, if the purchaser and the provider are the same legal entity there is no transaction to which competition law can be applied. Even if providers in type 1 relationships are not undertakings for the purpose of CA 1998 and Articles 101 and 102, they are in no sense immune from competition law obligations. First, there are statutory dispute resolution provisions applicable where it is alleged that one public provider is exploiting its position by (for example) charging unreasonably high prices to public purchasers (see NHS Act 2006 s.9(7) and the National Health Service Contracts (Dispute Resolution) Regulations 1996). In BetterCare the Competition Appeal Tribunal saw this dispute resolution mechanism as a competition law regime, though the regime does not allow third parties to raise a dispute. Secondly, from April 2008, purchasers and providers of NHS funded services have been required to comply with the Department of Health’s Principles and Rules for Cooperation and Competition (PRCC). A third iteration of the PRCC came into force in October 2010. The rules cover four areas: (1) procurement of NHS services; (2) anti-competitive conduct by providers and commissioners; (3) mergers between NHS organisations; and (4) false and misleading advertising of NHS services. Finally, there are the changes being introduced by the Health and Social care Act 2012. The Act is silent on the applicability of CA 1998 and Articles 101 and 102 TFEU (though there are provisions relating to the applicability of The Enterprise Act 2002). Section 81(1) requires any person offering health care services to a public purchaser (NHS commissioner) to hold a licence issued by Monitor. Monitor is currently consulting (until October 23) on the licence conditions, some of which will impose competition obligations. Irrespective of whether type 1 situations fall within general competition law, competition law obligations contained in the licensing regime will therefore apply. I was earlier told that only 5 NHS trusts were involved in exchange of info but now I get to know that there were 8 of them. I have serious doubts about the kind of info that was exchanged.